GUYS!! Thanksgiving is like two days away and I have nothing done!! I don't have any of my gazillions of desserts made or my superhero costume ready!! What do you mean? 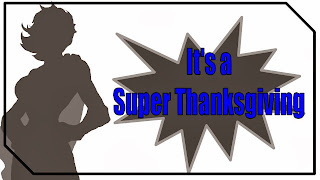 Are you saying you don't wear a superhero costume for Thanksgiving? Weird. You may think I'm joking, but I'm not. My family doesn't do the boring eat turkey and fall asleep watching a sports event kind of Thanksgiving. We Party like it's 1920! Every year we have a different Thanksgiving Them. We have been Romans, gangsters, Packers (we are from Wisconsin), Pilgrims and Indians. We have done different decades where we had to dress like we were from the 20's, 50's, and 70's and such. One year we even dressed up like different countries and had to bring a native dish. It's always hosted at my parents house and let me tell you, my mom goes all out! She decorates our basement to fit the scene, painting murals and setting tables, she plans games and competitions and skits to keep us in charater. We have even done a few murder mysteries to add a little suspense to the show. 1. What is your secret identity (my superheroes name is)? 2. 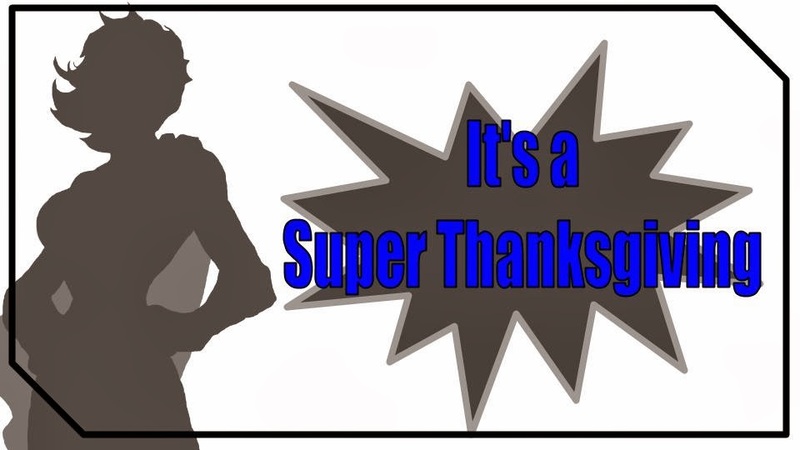 What can your superhero do (list and explain your super powers)? 3. Who are you really (what is your superhero's alias? What does he or she do when not in costume)? 4. Create your own world (name the city or place your superhero lives. List and describe your SH villains and archenemies. List and describe your SH friends)? Thanksgiving at our house is no joke. It is my absolute favorite holiday. It's not everyday you can see your grandmother in a long blond wig and cheer leading outfit with pompoms doing a cheer routine. And can you just imagine all the people wearing spandex this year? There is only two days left and I am sad to say I have no spandex in my wardrobe! Talk about bad life choices. Word to the wise, always keep spandex in your wardrobe in the likely event you have to dress as a superhero for a family holiday, or save someone from a burning building on the way. I am even such a bad procrastinator that I have NO IDEA what I'm going to be for my super hero!!! Any suggestions or ideas for me? What would your super hero be? You could get a white apron and sew a bunch of cooking utensils to it and be 'KITCHEN UTENSIL GIRL' No idea what the super power would be? Able to flip a pancake faster than a speeding bullet? I like it. My alter ego would be cleverly disguised by my real lack of cooking skills. Nobody would see it coming! KITCHEN UTENSIL GIRL....saving the world one pancake at a time!! Bahahah! You and +Dallas Adams crack me up!! And I do have the pale skin to pull this off! I went to California once and our first Taxi driver asked what country we were from because Mona and I were so pale. Little did he know that we were at our Wisconsin summer tannest. How about Luna the Axe-Wielding Princess. It's cheap but has a lasting effect. You don't kill people, but you can perfectly hack a turkey in fifteen seconds. You would win hands-down, if for no other reason than you would solve the hunger problem quickly, and people would be afraid you would hack them. Well...I wouldn't say it's a normal way to celebrate this holiday. Actually I have never heard of anyone else celebrating this way. My family can be a little unique at times.